If the HX90 didn't exist the WX500 would seem very attractive. It has an excellent specification and should deliver the same image quality as the HX90, but the lack of a viewfinder could be an issue in sunny conditions. 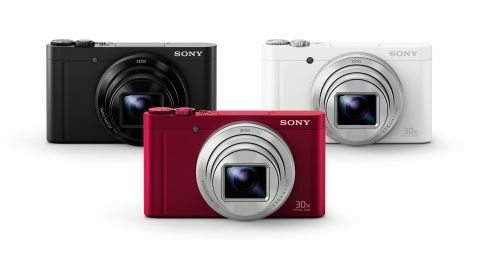 Like the Sony HX90 and Sony HX90V announced at the same time, the Sony WX500 is a 'travel compact' camera aimed at people who want a relatively small, light camera with a large lens zoom range. In fact the WX500 shares much of the specification of the HX90, which means that it has a Zeiss Vario-Sonnar T* f/3.5-6.4 lens with an optical focal length range equivalent to 24-720mm. That's an incredibly versatile range that could make many photographers with interchangeable lens cameras extremely envious, especially as the WX500 has 5-axis image stabilization too. Part of the reason that this huge zoom is possible, of course, is that the WX500 has a sensor that is quite a bit smaller than the average device inside an interchangeable lens camera. Nevertheless, the 18.2-million effective pixel 1/2.3-inch type Exmor R CMOS sensor inside the WX500 has a pretty good track record because it's the same one found inside the popular Sony HX60 (as well as the new HX90). Our tests found that the HX60 is capable of producing high quality images that look great at normal viewing sizes. At 100%, however, the level of smoothing to hide noise made the image look less attractive, but Sony has adjusted the processing that is applied by the Bionz X engine in the WX500 and HX900 to retain more detail. This is likely to mean that you'll see more noise in images at 100%, but it shouldn't be a huge problem. We'll know more when we get a full production sample in for testing. As a more affordable version of the HX90, there are naturally going be a few compromises with the WX500. The most significant is that it doesn't have the pop-up viewfinder. When you're shooting indoors or in low-light this is unlikely to be a major issue, but in the bright sunny conditions that we all hope to experience during the vacations that the WX500 is designed to be taken on, it can make composing images tricky. That said, the screen on the pre-production WX500 that I tried shortly before the camera was announced seemed very good, but I've yet to use it in the type of conditions that cause reflections. Like the HX90, the WX500 is designed to meet the requirements of novice photographers and offers a collection of automatic shooting options, but there are also exposure modes to suit more experienced photographers: shutter priority, aperture priority and manual. Like the HX90, though, stills can only be recorded in JPEG format as there's no raw format shooting option. Videos, however, can be shot in Full-HD at 8 bit and 4:2:0 at up to 50Mbps in AVCHS, MP4 or the new XAVC S format at 50/60p. The WX500 could slip in unnoticed amongst Sony's more advanced RX100-series of high-end compacts, although of course it doesn't have the pop-up viewfinder of the RX100 III. It also lacks the small grip that graces the front of the HX90 and the control ring around the lens. Some may not miss these two refinements, but the grip makes the HX90 feel just a little more secure in your hand and the lens-ring provides a quick and convenient means of changing exposure. Nevertheless, the WX500 is a very smart, tidy camera and thanks to its mode dial it's easy to switch between shooting modes. It also feels well made and all the controls are within easy reach. Further good news is that the 3-inch screen tilts up through 180 degrees to make shooting selfies easier. This is also handy when you're shooting from especially high or low angles. As yet we haven't been able to examine any images that we've shot with the WX500. However, I'm reasonably confident that it will produce decent images, at least at normal viewing sizes. I'm looking forward to checking a few at 100% to see exactly how much detail and noise is visible as a result of the new processing regime that Sony has employed. In my brief time with a pre-production sample of the WX500, I was able to ascertain that its autofocus system is pretty snappy even in quite low light and that it does a decent job of handling colours in a fairly well-lit meeting room. Naturally, we'll use a production sample in a much wider range of conditions to test this more fully as soon as one becomes available. While the WX500 is an attractive camera with a solid specification, it goes on sale for £280 (about US$410/AU$540), only £50/US$73/AU$95 less than the HX90, which brings all the same features plus an electronic viewfinder. This should make it much easier to shoot photographs in the type of conditions that the WX500 is designed to be used – bright sunlight. Consequently, provided that the HX90 fares well in our full test, I'd recommend saving for a little longer to buy the HX90 if you can.